Explore a Central American wonderland of reefs, rainforests and ruins. We have over 35 years of travel experience in Belize and Mesoamerica to help you design an educational tour to suit your interests! 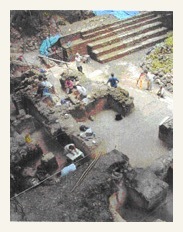 We specialize in archaeology and anthropology in concert with the natural history of the area. We design in-depth itineraries, customized for couples, private groups, schools, and organizations. 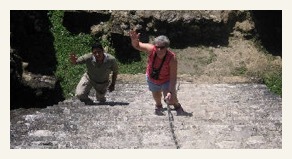 Explorations Inc., is proud to offer a custom educational travel experiences in Belize. Belize offers a wide range of cultures and ecosytems. You can explore inland environments such as rainforests, tropical broadleaf forests, savannas and the pine forests of the mountain pine ridge area in addition to the Caribbean Coast and with it offshore reefs and islands. 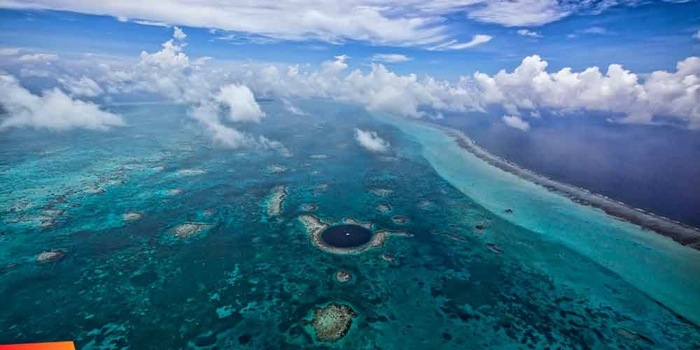 Belize is a small country, but also one of great ecological diversity. Formerly British Honduras until 1973, its official language if English. It is a tropical blend of Caribbean and Latin. Slightly larger than Massachusetts, it only has a population of about 300,000, making it the least populated Central American country and one of the lowest in the world. Approximately 60% of Belize remains forested, with 3,408 species of vascular plants in 209 families and new species being discovered nearly every year! Over one-third of its land area falls under some form of official protection. Savannas, scrublands and wetlands constitute extensive parts of the nation's land cover. As a result, the biodiversity is rich with a host of flora and fauna. In this unique country there are more than 500 species of birds. Colorful toucans, fiery scarlet macaws and even the jabiru stork with its five foot wing span inhabit Belize. Although rarely seen, five species of cats- jaguar, puma, ocelots, jaguarundis and margays also live here. In the wild, you will have a better chance of viewing monkeys, kinkajous, colorful tree frogs and a plethora of beautiful butterflies, birds, and strange looking insects. 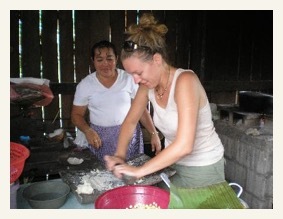 The friendly people of Belize make the country a true "melting pot" of cultures. Most Belizeans speak English, the official language, but also commonly heard languages include Creole (or English patois), Spanish, Garifuna, three Mayan languages, Mennonite German, Chinese, Lebanese, Hindi, and even traces of southern drawl from descendents of past refugee Confederates! Imagine... looking into a face carved in stone hundreds of years ago while hearing the daunting calls of nearby howler monkeys! Our Belize tours have a strong focus on learning about the various geographical areas and ecosystems visited. The goal is to explore the country's diversity with an itinerary that is conducive to the discovery of nature's secrets and to achieve a better understanding of the Belizean peoples. Explorations is happy to help couples and groups with custom itineraries. Below is a great introductory tour of 8 days, featuring some of the best of Belize, that we can operate most any week. If you have longer time for travel or specific interests, we can create itineraries to suit - see below for options and ideas. All meals at Lamanai Outpost and Pook's Hill lodges. For couples and small groups, we suggest Coral Bay Villas - http://www.coralbaybelize.com/, or Exotic Caye - http://ambergriscaye.com/playador/index.html. Your two jungle lodges have been chosen for their charm and strategic locations. 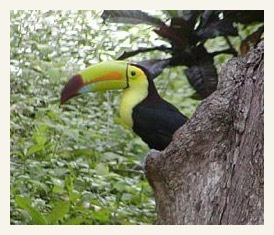 Belize has some of the most extensive tracts of primeval rainforest in Central America. These forests are inhabited by healthy populations of some of Tropical America's rarest and most beautiful creatures including the jaguar, ocelot, gray fox, black howler monkey, Central American spider monkey, tapir, peccary, red brocket and white-tailed deer, agouti, paca, Mexican porcupine, scarlet macaw, jabiru stork, toucan, ocellated turkey, harpy eagle and many others. We do not guarantee you will see them all, but you will be staying in locations that give you excellent opportunities. Lamanai Outpost Lodge (www.lamanai.com) is situated on the banks of a 28 mile long, spring fed lagoon amid the remnants of a major Maya city. It is surrounded by an incredible variety of habitats that facilitate unsurpassed nature activities. It's remote location provides the Lamanai Outpost a world of its own. The Lamanai Outpost has twenty Cabanas, with private bathrooms, ceiling fans, even a mini-fridge, and a relaxing verandah to catch the prevailing breeze that comes in from the lagoon. Lamanai Outpost has been repetitively featured on shows such as Wild Things, Discovery, Animal Planet, National Geographic Explorer and World Gone Wild. Voted Belize’s Hotel of the Year for 1999/2000, the Outpost is consistently utilized by high-end travelers and is widely recognized as one of Belize’s finest jungle lodges. Their meals consistently receive excellent guest comments. With almost 400 species documented within a 3 mile radius, the Lodge is definitely one of Belize’s premier birding locations. Habitats range from vast wetlands and broadleaf forest to pine savannah and all are easily accessible by boat, trails, vehicle or canoe. The Spotlight Safari provides an amazing opportunity to see roosting waders, nocturnals and some of the more elusive diurnal species up close and personal. Regular sightings include the Northern Potoo, Yucatan Nightjar, Common Pauraque and Nighthawk, Grey-necked Wood Rail, Sungrebe and Agami Heron. Also around the lodge you may observe (and hear) troops of Howler monkeys as they start the day foraging high in the jungle canopy. Pook's Hill Lodge (www.pookshilllodge.com) is located in the foothills of the Maya Mountains in the Cayo District of Belize. The lodge is situated within a 300 acre Private Reserve, on the site of an ancient Maya Plaza Group. This, coupled with its unparalleled position in the very heart of the country, makes Pook's Hill a perfect base of operations. Its own reserve of primary rainforest borders on the Tapir Mountain Nature Reserve, a 6,800 acre sanctuary managed by the Audubon Society of Belize - which is home to colorful toucans, butterflies, hummingbirds, howler monkeys and jaguars. Nature trails in the reserves take you past giant Mahogany, Cedar, Strangling Fig and Ceiba. 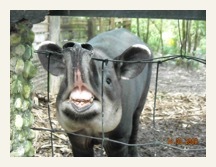 The forest is the home to the tapir, jaguar, coati mundi, gibnut, and a myriad of birds. Your thatched cabanas surround a Maya archaeology site and overlook the forest and creek below. Each cabana has a private bathroom, electricity and fan. The bar/veranda is ideal for birding or just relaxing in the tranquil setting. Nearby is the clear water of the Roaring River cascading down a 1000 feet of fall in the Maya Mountains. Pook's Hill has two miles of frontage on the Roaring River, perfect for tubing or cooling off in one of the hidden jungle pools. Pook's Hill has been endorsed by ornithologists as being in a league of its own. The birding from the lodge veranda, the meadows and along the riverside is superb. Birders can enjoy miles of forest trails, river walks and open landscape. Hummingbirds give a spectacular display at the veranda and there are good sightings of trogans, motmots, toucans and most of our forest species. Activities at the lodge include birding, horseback riding, hiking, river tubing and swimming. The lodge is walking distance from the cave, Tunichil Mucnal, the most adventurous caving expedition in Belize. At the heart of the Pook's Hill property is a Maya residential complex dating mainly to the Terminal Classic Period (ca.830-950 AD). Exploration of the cultivated fields and jungle around the resort has also revealed a whole Maya settlement landscape. Architecture and artifacts from Pook's show signs of long-distance contact with central Mexico (Teotihuacano ceramic styles, green obsidian, and a circular shrine) and with the Caribbean coast of Belize (parrotfish and the incised Hawksbill turtle piece). Ambergris Caye is the largest island in Belize, and the main destination for travellers to this western Caribbean nation. San Pedro is the only town on the island. 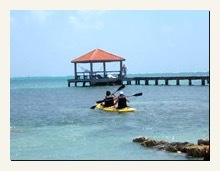 Ambergris Caye has been the hub of Belizean area maritime trade for centuries. Fishing, coconuts, and chicle were historic means of islanders support, but the last thirty years have led to a large growth in both the Belize dive and scuba trade, and ecotourism. The rich variety of things to do in San Pedro Town makes Ambergris Caye great for activities and exploring in addition to relaxing poolside or on the beach. The quality and variety of art available in Belize and Ambergris Caye is quite exciting! The Caribbean lifestyle is superbly shown by the local artists. Seascapes, Garifuna artwork, animal paintings, local street scenes, amazing landscapes. You must see them to believe them. 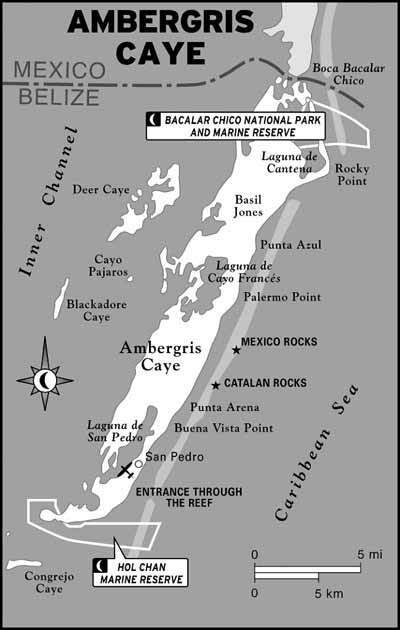 The history of the island goes back to the days of the Maya, European Pirates, and Mexican Refugees who fled during the Caste War. The descendants from Mexico make up most of the island's population today. The economy of the island was once dependent on the coconut industry, followed by the fishing industry, but it is now dependent on tourism. For those interested in Mayan archaeology, we can arrange tours to the major and minor sites in Belize and in nearby Guatemala, such as: Tikal, Lamanai, Caracol, Altun Ha and Cahal Pech, Cerros, Xunantunich, Nim Li Punit, Lubaantun and more. For those interested in birding, we can arrange birdwatching tours based on species of interests. Birding tours can be customized based on the diverse geography: Low elevation Maya Mountains; pine ridge; broadleaf forest; savannah areas; riverine systems; mangrove estuaries, Caribbean cayes (islands). Over 540 species of birds call the small country of Belize home and our guides can help you find them! Thank you for the interest in our adventures of discovery!